DON’T BLINK – a simple instruction and one known the world over by Doctor Who fans as the only protection against The Weeping Angels. But as the quantum-locked assassins return in a new Doctor Who series two-parter, actor Finlay Robertson reveals it is incredibly difficult to do. 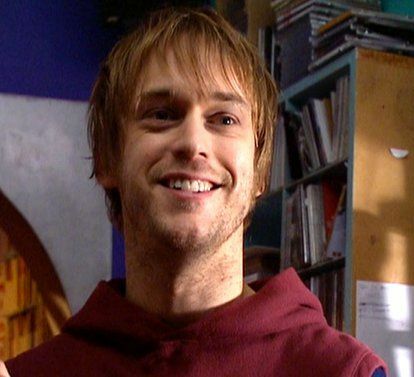 Fin, 34, took on the Angels when they first appeared in the brilliant Doctor Who episode Blink as Larry Nightingale, the lovable geek who wins the day and Sally Sparrow’s heart. He explained: “Not blinking was a very challenging thing to do, especially when you’re looking at a Weeping Angel. I mean, we saw the costume and so on, but when they put the eyes in and were in front of me, they were really creepy. Like everyone else, Fin will be tuning in tomorrow to see how Steven Moffat brings back The Weeping Angels, after it seemed the Doctor – with help from Larry and Sally Sparrow – had trapped them for good at the end of Blink. He said: “I’m going to a birthday party in the afternoon, but I will be slipping away to watch because as I remember last time, the Doctor constructed a cunning trap and that was the end of them. “But I guess because they were such brilliant monsters and the episode was such a hit, you would have to find a way of bringing them back. Steven Moffat is so clever as well, I’m sure it will be in a way that the fans will love. Unlike the Doctor, Fin has nothing but fond memories of the Weeping Angels on Doctor Who, a programme he watched as a boy during the Tom Baker–Peter Davison eras and was excited to be a part of as an adult. Now regarded as one of the greatest ever Doctor Who stories, Fin says Blink’s qualities leapt off the page from the first time he read the script. “You could see straight away what a brilliant and clever concept it was, using the idea of statue monsters that only move when you’re not looking at them. Who hasn’t thought that when they see a statue out of the corner of their eye? But the role didn’t come easily for Fin, who had to audition several times and then re-audition when actress Lucy Gaskell was cast as his sister, Kathy. “Because she has a northern accent they wanted to see Larry again to match that. I’d had a couple of auditions by then, but I went back and did my Manc accent and it worked out'” he said. “I grew up in the north and my voice tends to go that way when I have had a few pints so it wasn’t too hard for me, but when we were filming Blink, BBC 2 were repeating a programme called This Life and I was watching it each night. Once on the set, Fin threw himself into the role alongside the now Oscar-nominated Carey Mulligan. “Carey was very nice, as well as being a brilliant actress and enjoying the experience as much as I was in terms of being on Doctor Who,” he said. Fin added: “The secrecy around the set was something new to me. My script had my name on it and was watermarked, which was a kick. “Filming on the TARDIS was an amazing moment, but there was a man there whose job was to make sure we didn’t take any pictures on our mobile phones in case they got out. Fortunately the make-up department were very nice. They had to take close up pictures of us to make sure our hair and make-up matched between scenes, but some of those pictures got the TARDIS in too. Looking back now, Fin says he feels very proud to have been a part of Blink and the world of Doctor Who. “I was always aware I was contributing to something with a heritage and a shared history that means so much to so many people, me included,” he added. “Doctor Who was an important part of my childhood so to get letters or have conversations now with kids and their parents about Blink is wonderful. People always remember Blink as ‘the brilliant episode’ and I’m delighted it still generates that feeling and enthusiasm. 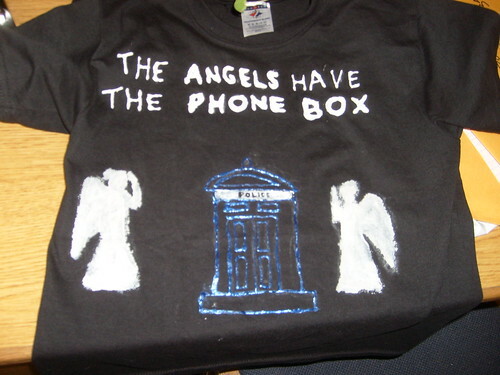 “There’s a line in the script where the Doctor says ‘The angels have the Phone Box’ and my line was ‘that’s my favourite, I’ve got that on a T-shirt’. I couldn’t believe it when I was looking on the net and a found someone had actually printed it out on a T-shirt for real. He must have been pretty smart though to end up with the lovely Sally Sparrow when the episode ended. Where does Fin think they are now? “I think they lived happily ever after,” he said. “They’d have lots of kids and Larry would be the classic nerdy, bumbling dad who is a little bit embarassing but who is held in great affection by his kids.